WizardPage: Represents a wizard's page and by default it will have the “Previous”, ”Next” and “Cancel” buttons visible. This behavior can be controlled through the ButtonsVisibilityMode enumeration. WelcomeWizardPage: Represents a welcome page. It derives directly from WizardPage and the only difference is that it will have the “Next” and “Cancel” buttons visible by default. CompletionWizardPage: Represents a completion page. It derives directly from WizardPage and the only difference is that it will have the “Previous”, “Cancel” and “Finish” buttons visible by default. Header : Enables you to define anything as a header. Title : Provides you a way to define a title for the page. SideHeader : Enables you to define anything as a side header on the left side of the page. Content : Contains the page content (WizardPage derives directly from ContentControl). Despite that the WizardPage is a ContentControl it will propagate its DataContext to its child containers including the elements defined as a Content. Thus, the source of the binding has to be explicitly set if needed. All these properties can be used to get or set the data template, respectfully, for the header, side header and footer. So, if you want to change those default elements for a particular wizard page, you may define them as in Example 1. 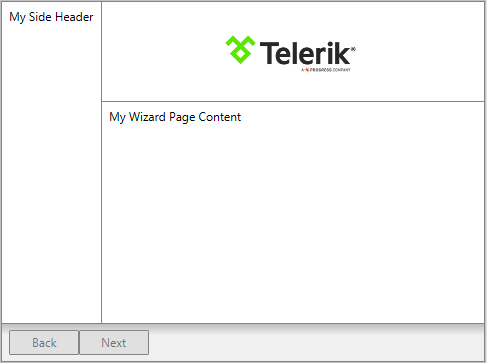 In order to use the built-in commands, you should define the following namespace: xmlns:wizard="clr-namespace:Telerik.Windows.Controls.Wizard;assembly=Telerik.Windows.Controls.Navigation"